Monday morning was a beautiful morning on James Street so I decided to work outside. I took a few minutes and sat in the city silence, enjoying the sound of the passing traffic, the wind in the peeling sycamore tree, the sound of cicadas high up in other trees on other blocks. I read a portion of Erika Morrison’s book Bandersnatch. I’m getting toward the end and find I’m reading it slowly, sipping it, like the last bit of a good drink at the end of a delightful evening. I set the book aside and felt a little overwhelmed at how much work I had to do – Mondays are usually that way. But I brought all my work out on to the front porch and started with the fun part – the bills. I looked up and saw her standing at the bottom of our steps: a white-haired woman. She wore a red skirt and a green top that she kept tucking in nervously. She leaned over, her hand on the iron railing. “I’m sorry?” I said because I was sure I hadn’t heard her correctly. People don’t just walk the city streets asking random strangers to walk their dogs. Right? “I’m looking for someone to walk my dogs,” she repeated, and I looked around. I still couldn’t believe she was talking to me. I was busy. Didn’t I look busy? In my mind, I started to reply to her. I’m sorry, I have too much to do. Good luck. I’m sure you’ll find someone. I’m not even a dog lover. If you are looking for a stranger to walk your dog, don’t you at least want them to really love dogs? But I looked up and down the street and no one was there. No one was anywhere. It was just me and this white-haired woman. And I remembered a passage from Erika’s book. I remembered all she had written about seeing Jesus in the people around us, and I realized with startling clarity that this woman, with her hesitant smile and insistence, with her missing teeth and her wind-blown hair, was Jesus. Jesus needed me to walk his dogs. Which, let’s be honest, was slightly inconvenient and even a little annoying. If Jesus would ask me to move to Iraq or do something else radical, I’d probably do it. But something simple and inconvenient? Something I don’t feel “called” to do? I sighed and packed up my things because I knew I wouldn’t experience a moments peace for the rest of the day if I didn’t walk these dogs. I left with the woman who said her house was only just around the corner. I asked her what kind of dogs she has. To say she was a slow walker would be the understatement of the year. I asked her about it, and she said she had arthritis in both knees. 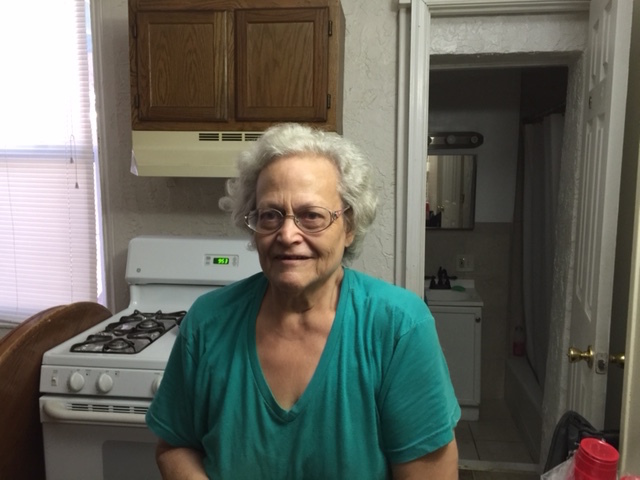 She told me about how her mother had died a few years ago, how she had moved south to take care of her, then came back to Lancaster after she passed. She asked me what I did and when I said writer her eyes lit up. “I’ve always wanted to write down my own stories,” she said, and proceeded to tell me things about her life. Graduating from the community college when she was 54. Going to Catholic school when she was a girl. I followed her into a dark corridor and up two flights of hand rail-less steps. I thought that this could be the beginning of one of those stories that doesn’t always end very well, the kind of tale that ends in a mugging or a dog bite. But I’ve told myself recently that I need to do more things worth writing about, I need to live more adventures. It turns out the first one was walking two pit bulls owned by a woman who lived around the corner, a woman named Barb who I had never met before. She practically had to crawl up the stairs because of her knees. I helped her when I could. She climbed those stairs like Everest, all the way up, then opened the door to the dogs’ room. A pit bull jumped up on me. She was the older one, brindle colored with scars on her head. “Oh, good, she likes you,” Barb said with obvious relief in her voice. We talked for a little while, and then I walked the dogs. The older one was well-behaved and left slack in the leash. The younger one pulled me down the sidewalk. When I got back I asked her for a favor. “Oh, my,” she said, “I have to fix my hair. She rain into the bathroom and came out, furiously patting her clothes down and fixing her hair. She was suddenly a bundle of nerves. Maile came back from running her errands and found me on the porch, working. Leo was asleep in the stroller. Mai started to laugh, because she knows I like to keep to myself. She knows I’m not a spontaneous kind of person. “How was it, walking the dogs?” she asked, smiling. I told her about Barb. I told her about the dogs. I shook my head, finding it hard to believe how far outside of my expectations a morning can go when I follow that quiet voice. The voice only audible in the silence. I always knew there was more than what my eyes could see. Maybe that’s why it’s easy for me to imagine Eden. I have my own version, the place where I clearly remember my early childhood experience as beautiful, wild, and protected. In prose that is at once lyrical and utterly honest, a brave new voice takes you on a windswept journey down the path of brokenness to healing, satisfaction, and true intimacy with God. Amber Haines calls us to dispense with the pretty bows we use to dress up our stories and instead trust God to take our untidy, unfinished lives and make them free, authentic, and whole. Here’s the cover. Isn’t it beautiful? I have an extra hardback copy of the book, so if you’d like to win it, simply let me know in the comments below. I’ll choose a winner at the end of next week. I decided to close down my Facebook and Twitter accounts in June (you can read more about that HERE), so this little space of mine depends entirely on you to spread the word. If you read something you enjoy, please share it. Also, if you’d like to receive my twice-monthly newsletter (basically a few bonus blog posts every month plus information on upcoming books) you can sign up for that HERE. Thanks for another beautiful entry ‘re: seeing the big call of Christ in the smallness of our everyday. Of course, I’ve been anticipating Amber’s book since you first put out the Word and I read the beautiful 1st chapter a month or two ago, would love to be in the drawing. All the best, Preetam. Great story! I’m a dog owner who is also not a dog lover. My husband and kids are dog lovers though so I’ll keep feeding the mutt. I’ve heard great things about Amber’s book and would love to win a copy! Love this story! Great reminder to see inconveniences as opportunities! I was thrilled to see another post by you. I’m so fascinated with people’s stories…..those people we walk right by, those people we know as acquaintances but have no idea what their stories are, those people we know but really don’t know their stories. Thank you for sharing. I would love to have a copy of Amber’s book. Loved this. And so convicted by it. I love to keep to myself and my plans and little corner of the world. But it’s a beautiful thing to step outside of it. Thanks for the inspiration. Would you really move to Iraq? Just wondering. Great reminder of the importance little decisions make each day that add up to make a life. Please drop my name in the hat to win Amber’s book. I don’t know for sure, Jan, but based on my life so far it seems I’m much more willing to do the big, crazy things than I am to do the everyday things. I’d love to win a copy of this book as I have been reading so many good things about it. But more so, I am so glad each time I read your posts. I’m grateful for the reminder we can do ALL things to minister the love of Jesus to others. Yes, even walking a pit bull. Blessings! I wonder if thats why I always make so much noise…? Something about Barb…she reminds me of my Grandma…she looks like she is right on the cusp of saying something life-changing…or telling an amazing story. Loved this post. Amazing where we “find Jesus,” isn’t it? And I would absolutely love a copy of Amber’s book. Wild In the Hollow…something about that title reminds me of childhood and all things good. Blessings! I loved this post ! As I do most everything you write…. And it reminded me to take the time to see people as Jesus would . i would love to win Amber’s book. thanks you. I love “the voice only audible in the silence”. Being still and listening is something I’ve been trying to learn to do lately. It’s wonderful :) And I would love to win a copy of the book, it sounds like a perfect read for me! Such a great read. You made me a bit homesick for Lancaster city, Shawn! Thanks for sharing. Thank you for your grace-filled posts. I’d love to read Amber’s book. Count me challenged…your post today about the Beautiful, Hidden Life came at the perfect time for me. Amber’s book looks like a great read too! Oh I would love to win a copy! This is on my “to-read” list on Goodreads!! PS-what an awesome story-walking this woman’s dogs. Loved it. great story. Put my name in the hat for the drawing, please. Personally, I would have liked a picture of you walking the dogs too, haha. Great post Shawn. “She wore a red skirt and a green top that she kept tucking in nervously. She leaned over, her hand on the iron railing.” I was there… in my mind watching the story with you. Not many people can take me to places with their words but you did. Thanks. As for your friends book; well I guess we all would like it so I don’t envy your having to choose who. 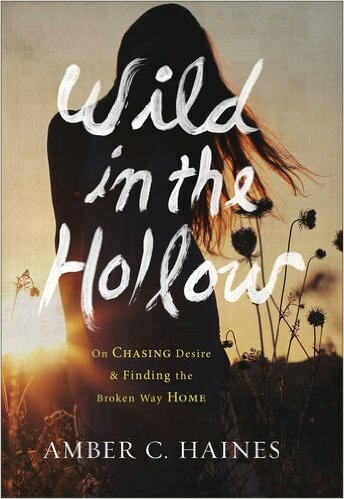 I would love to win a copy of Wild in the Hollow. Thank you. Shawn, I’m new to your blog via Noisetrade and your book, Building a Life Out Of Words. I love the way your writing draws me to notice the small things in my life. It’s beautiful to experience Jesus working through your words. Last week I read your previous post, “When I made my Dad cry”. It brought me to a place of silence before God. I copied it into my journal. On Friday my father-in-law passed away. As I sat down with my journal yesterday, I noticed your poetic words as the last thing I had written. I’ve been blessed & comforted twice now through that one post. What you do is not a small thing. Thanks for the nudge to live a more adventurous story as well. I keep seeing this book EVERYWHERE! :D It looks great! I have just recently started reading your work and I’m not sure how I came across you. Your newsletter topic (Your Beautiful, Hidden Life) really struck me because that is a place I live now, looking for those smaller moments, relishing them, seeing them for the miracles they are. Thank you! I love Amber. And I’d love a copy! I can’t believe this is only her first book. Her writing is soul-searching. Just found your blog- I like your voice. Pitbulls… So have you become her official dog-walker? God bless you for walking those dogs! I’d love a copy of the book!